Three times a year, in March, July and November (in conjunction with the Remembrance of Kuan Yin Pusa's birthday, renunciation and enlightenment), Than Hsiang Temple holds the Taking Refuge and Five Precepts Ceremony. 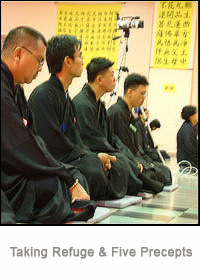 This is in addition to the Taking Refuge and Five Precepts Ceremony held yearly on Wesak Day. Taking Refuge is the confirmation that one wants to become a Buddhist, and one accepts (or reaffirms accepting) the Buddha as the perfect, enlightened teacher, the Dharma as the guide to the spiritual path and the Sangha as the supporting spiritual community. These three are also known as the Triple Gems. such is not the refuge supreme. is one released from all suffering. leading to the cessation of suffering.